Description: Given the composer's mystical preoccupations, his concern with the natural world and the environment and his view of music as a balancing force in the world, the consoling, consonant undertones of his output for organ are largely to be expected. The earlier pieces in particular are disturbed by dissonant stormclouds and chromatic mutterings, but Vasks' faith invariably leads to a consonant resolution. The more recent works are more overtly diatonic, with borrowings from Latvian church music. The restless Musica Seria, written during the upheavals in the Baltic states during the late 1980s, is the most chromatic, and the most dramatic work here. 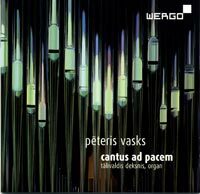 The incorporation of birdsong into Cantus ad pacem, especially in the context of the organ, is inevitably reminiscent of Messiaen, as are the insistent, clashing blocks of sound in Musica Seria, but for the most part, Vasks' music is less complicated, both harmonically and rhythmically. His idiom, familiar from the orchestral, choral and chamber works we have offered before, transfers well to the organ, though, as one might expect. Talivaldis Deksnis (organ of Riga Cathedral and of St. Gertrude, Riga [Te Deum]).